I love farmers and I work for Monsanto. I love farmers, always have and always will. I was raised in a farming family in farming communities. I now am married into another farming family and live in another farming community. If anyone ever asks me who the best people in the world are, my response is simple: farmers. Sure, doctors heal sick people, pastors offer spiritual guidance, and philanthropists help people who are oppressed. Those are all wonderful, worthwhile causes, but farmers feed people, which is the most important calling of all. Without food, people can't be healed, guided to higher powers, or helped out of oppression. Food is the foundation of all things, and that's why farmers are the best people in the world. Farmers have a lot on their plates though (pun intended). The farmers I know aren't just "farmers." They are mechanics, grain merchandisers, agronomists, truck drivers, marketers, meteorologists, welders, veterinarians, community leaders, plumbers, electricians, engineers, researchers, soil scientists and much more. So many skills fall under one "farmer" umbrella, and that's a lot for one guy or gal to handle. That's why I work for Monsanto. At Monsanto, we are committed to finding solutions that help farmers produce bigger and better harvests. Farmers are busier than ever, discovering ways to grow more with less, but that's a big challenge. That's a challenge I like helping farmers tackle. Actually, I don't just like it. 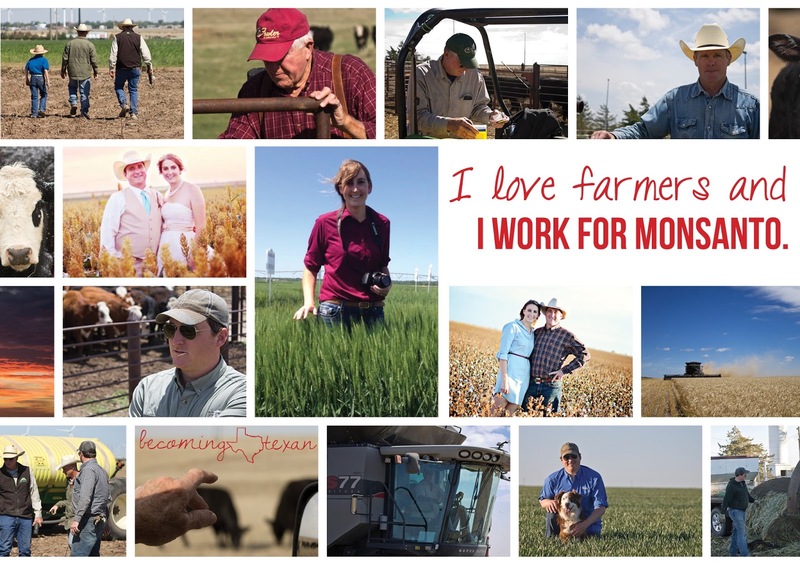 I am passionate about helping farmers because I understand all of the risks and hardships that go along with the job title of "farmer." That's right. I said I understand the risks of a farmer, and that's because I am a farmer too. My father is a farmer. My mother is a farmer. My grandfather was a farmer. My father-in-law and mother-in-law are farmers. My husband and I are both farmers. That's one of the best things about working at Monsanto. Many of the people I have met in my two and a half years with the company understood farming before they ever came to work at Monsanto. Some worked on farms of all shapes and sizes. Others grew up on farms. And even those who didn't know what farming was all about when they started at Monsanto have learned to understand it since - by interacting with real farmers. Since I was a high school freshman dreaming about my future career, I've always had the goal of working for Monsanto. Back then, I had no idea what particular job title I'd have, but the company has always remained a constant. Why? Because I love farmers, and I have always wanted to help farmers grow more food.